BSSF National Championship / Qualifyer & IFSS World Cup Event. Kings Forest. Although the lengthy rules may look a little off putting, in reality, folk will notice very little change from what is generally accepted in the UK sleddog racing circuit. Please make sure you are familiar with the rules before you enter. The changes that may be most apparent are: the minimum age of dogs for competition; necessity to carry a drop chain / cable in the team classes to allow a dog to be dropped from the team if necessary at the dog drop point whilst out on the trail (No use of dog bags) ; and having a locking brake mechanism (such as a Velcro or rubber strap) to hold a brake lever closed if needs be. Entries must be received by 7th February 2014 Look forward to seeing you all there! 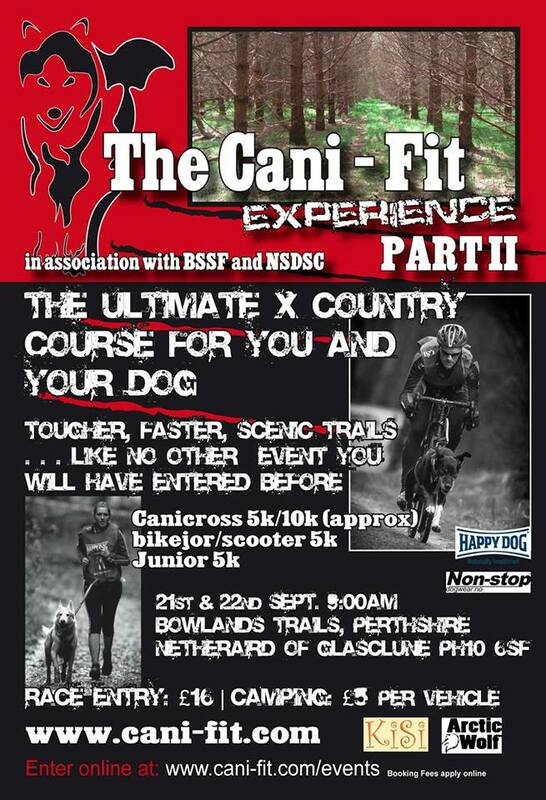 The NSDSC are pleased to be working Cani-Fit to be hosting The Cani-Fit eXperience II, which will be the very first British Sleddog Sport Federation (BSSF) accredited event to be held in the UK . The event is also a ‘warm up’ race for the athletes that will be representing the BSSF at the ECF European Championships in Switzerland, October 2013. Bowland Trails has a network of trails purpose built for running and training dogs in harness. There are some spectacular panoramic views of the hills of Perthshire. If you are lucky you might even spot red squirrel, fallow & roe deer, birds of prey on your race. The route takes you past the local Glasclune fold of pedigree Highland Cattle and Hebridean sheep.